Digital Glam, (“the Company”, “us”, “we”, or “our”), operates the website digitalglam.co We may change or add to this privacy notice, so we encourage you to come back and read it periodically. 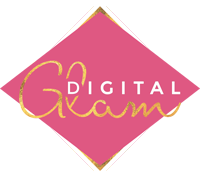 Digital Glam is the data controller that resides in 17 Byron Court, Boston Road, London, W7 2AY. This privacy notice governs the website Digital Glam informs you of our policies regarding the collection, use, and disclosure of personal data when you use our Service and the choices you have associated with that data. Your privacy is very important to us. •	Log & Device data. When you visit our site, we may automatically record information (“log data”), including information that your browser sends whenever you visit our site. This log data may include your web address you came from or are going to, your device model, operating system, browser type, unique device identifier, IP address, mobile network carrier, and time zone or location. •	Provide our Products and Services. We will use your information to provide our products and services to you. •	Understand and improve our products. We will perform research and analysis about your use of, or interest in, our products, services, or content, or products, services or content offered by others. We do this to help make our products better and to develop new products. o	Promotional. We may send you emails about new product features or other news about us or on topics we think would be relevant to you. You may opt out of these at any time. Visit the Your Choices section below. o	Responding to your requests. We will also use your information to respond to your questions or comments. •	Other. We also may use your information to manage our business or perform functions as otherwise described to you at the time of collection. •	With third party service providers, agents, or contractors. We use other companies, agents or contractors (“Service Providers”) to perform services on our behalf or to assist us with providing services to you. For example, we may engage Service Providers to process credit card transactions or other payment methods. Or, we may engage Service Providers to provide services such as marketing, advertising, communications, infrastructure and IT services, to provide customer service, to collect debts, and to analyze and enhance data (including data about users’ interactions with our service). These Service Providers may have access to your personal or other information in order to provide these functions. In addition, some of the information we request may be collected by third party providers on our behalf. We do not authorize them to use or disclose your personal information except in connection with providing their services. Analytics: Specifically for analytics providers, we use Google Analytics Google Analytics which is a web analytics service offered by Google that tracks and reports website traffic. Google uses the data collected to track and monitor the use of our Service. This data is shared with other Google services. Google may use the collected data to contextualize and personalize the ads of its own advertising network. Pinterest: You can learn more about Pinterest’s privacy practices at https://policy.pinterest.com/en/advertising-guidelines. You may also opt out of visitor retargeting by using the Do Not Track feature in your browser or through Pinterest’s personalization settings. Digital Glam will retain your Personal Data only for as long as is necessary for the purposes set out in this Privacy Notice. We will retain and use your Personal Data to the extent necessary to comply with our legal obligations (for example, if we are required to retain your data to comply with applicable laws), resolve disputes, and enforce our legal agreements and policies. Digital Glam will also retain Usage Data for internal analysis purposes. Usage Data is generally retained for a shorter period of time, except when this data is used to strengthen the security or to improve the functionality of our Service, or we are legally obligated to retain this data for longer time periods. •	E-mail. As described above, if you do not wish to receive promotional e-mails from us, you may opt out at any time. •	Cookies. Your browser’s help function should contain instructions on how to set your computer to accept all cookies, to notify you when a cookie is issued, or to not receive cookies at any time. •	Advertising. You can opt out of online targeted advertising by opting out within the advertisement itself or by visiting Digital Advertising Alliance, http://www.aboutads.info/, the Digital Advertising Alliance of Canada in Canada http://youradchoices.ca/ or the European Interactive Digital Advertising Alliance in Europe http://www.youronlinechoices.eu/. You can also opt out of the Digital Advertising Alliance using your mobile device settings. o	To access and receive a copy of the Personal Data we hold about you. o	You have the right to data portability for the information you have provided to us. You can request to obtain a copy of this information in a commonly used electronic format so that you can manage and move it. We will need to verify your identity before being able to respond to such requests. Please contact us at hello@digitalglam.co email. I'm so EXCITED to see you here on my site. I'm Anna, The Digital Marketing Strategist for 7 figure coaches but I also help those who want to learn and DIY, check my #GlamTribe HERE.